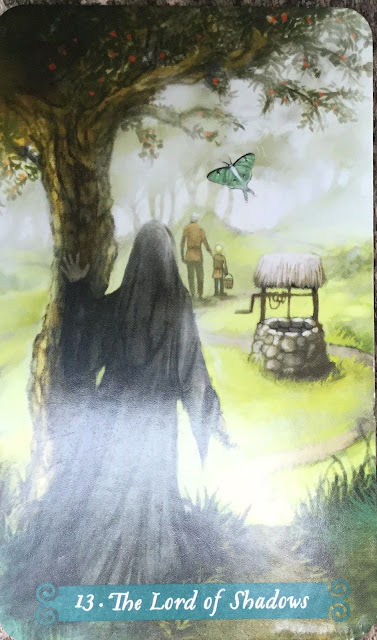 Daily Draw, The Green Witch Tarot, The Lord of Shadows. The moth in this card is moving from darkness to light. I suppose quite apt for an eclipse day. Or should it be the other way around - moving from light into shadow? That must be hard but she is blessed to have you by her side. The eclipse - What a thing to witness...we got a 10 % one here. I like the addition of the well, which is often seen a doorway to the other world. Remember the story of Mother Holle? This fairy tale is one of the last remnants of the Goddes Holda, a Teutonic goddess of a.o. of death and renewal. She is often revered during wintertime. A whisper of sadness. One day we all get to make the journey to the Summerlands. I hope I don't leave anyone in the shadows of grief.